As if the excitement over super rookie Elias Petterson wasn’t intoxicating enough for Vancouver, recent evidence suggests that forward Jake Virtanen is starting to realize his immense potential might just consume Canucks fans. After playing on the third and fourth lines for much of this season, Virtanen scored his seventh goal Saturday in a 4-3 shootout loss at Buffalo while skating predominantly on Pettersson’s line. Brock Boeser missed his third consecutive game with a groin injury, and Virtanen has rightfully taken a spot among the top six forwards with better all-around play and effectiveness. Virtanen is fifth on the team in points (nine) and is just three goals shy of last season’s total of 10 — but perhaps a more significant statistic was the career-high 20:20 in ice time he had against the Sabres. Virtanen’s 13:45 average time on the ice through Sunday is up by nearly two minutes from last season (11:59). Getting the third-most ice time among Canucks forwards Saturday is a testament to the confidence Canucks head coach Travis Green has in Virtanen, who is third in goals behind team leader Pettersson (10) and Bo Horvat (nine) through 18 games. Green has been giving Virtanen second-unit power play duty and ice time late in games and in overtime after past seasons in which the fourth-year pro would have been pinned to the bench. And Virtanen’s confidence has been bolstered as a result while noticeably enjoying his and the team’s early season success. “Obviously, it’s having that trust between us. He’s been putting me out late in games and I’m feeling confident. I’m holding on to the puck longer and not just forcing a play if I have guys on me,” Virtanen said (from “Fans’ #shotgunjake salute helps Virtanen have fun while improving game,” The Province – 11/8/18). Virtanen paid back that trust while skating down the left wing against Sabres defenseman Zach Bogosian and putting the Canucks up 2-1 late in the second period with a sly backhand to the far post past goalie Carter Hutton. That also caused some early beer drinking on the West Coast because Canucks fans have embraced a social media movement of shotgunning beer whenever Virtanen scores a goal. Even the 10 a.m. PT start time didn’t stop some Canucks fans from taking part in the #ShotgunJake trend of puncturing a hole in the bottom of a beer can, pulling the tab and chugging the fast-rushing contents through the hole. Blessed with size and speed, the 6-foot-1, 226-pound Virtanen has teased the Canucks faithful with sporadic glimpses that he can be an elite NHL power forward. The pressure of being a local kid from nearby Abbotsford, B.C., and the sixth overall pick in 2014 hasn’t helped while he’s been criticized for his maturity, conditioning and decision-making. 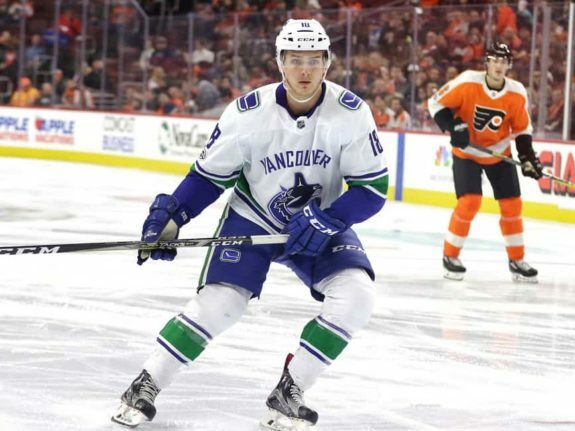 Those growing pains appear to be mostly behind him as Virtanen, who signed a two-year, $2.5 million contract this past summer, tries to prove he is an integral part of the team’s young core. Pettersson, Boeser and Horvat are clearly foundation players, but can Virtanen show he can be a fixture in the club’s promising future? If not, he’ll end up as trade bait in an effort to shore up weaknesses elsewhere in the lineup. Virtanen had arguably his best game as a Canuck back on Oct. 31 at home against the Chicago Blackhawks. The 22-year-old scored a breakaway goal and ripped a laser of a wrist shot into the top corner over Corey Crawford’s blocker for the first two-goal game of his career. Virtanen also asserted himself with a crowd-pleasing, big hit on Luke Johnson that rankled the Blackhawks. Even the most optimistic Canucks fans don’t expect frequent multi-goal games, but physicality and intimidation on a regular basis will turn him into a crowd favorite among the teetotalers and binge drinkers alike. Another case for Virtanen is the play of Loui Eriksson, who was getting more time on the right wing of Pettersson’s line with Nikolay Goldobin before this current road trip. Eriksson has broken out of his goalless drought with four goals in the past four games, but none of them occurred with Pettersson on the ice. Virtanen, however, has goals in consecutive games on Pettersson’s line. Green declared Saturday that Boeser was “week-to-week” and will miss at least three more games. This gives Virtanen a great opportunity to make a bigger name for himself this week, fittingly riding shotgun with Pettersson.